Walt Reed was trained as an illustrator at Pratt Institute in Brooklyn and the Phoenix Art Institute in New York City. He freelanced as a book illustrator prior to joining the instructional staff of the Famous Artists School in Westport, Connecticut. There he worked with some of America’s most prominent illustrators, including Norman Rockwell, Stevan Dohanos, Robert Fawcett, and Albert Dorne. Reed also served as editor for North Light Publications from 1972 to 1976. In 1974, Reed founded Illustration House, Inc., a gallery specializing in the field of illustration and dedicated to the preservation of this vital form of American art. His many books on the subject of illustration include, The Illustrator in America (the invaluable chronological compendium of illustrators and their art which has been updated and re-issued several times); Harold von Schmidt Draws and Paints the Old West; John Clymer, An Artist’s Rendezvous with the Frontier West; Great American Illustrators; The Magic Pen of Joseph Clement Coll; The Art of Tom Lovell—An Invitation to History; and Harvey Dunn: Illustrator and Painter of the Pioneer West. Reed also designed the Bicentennial 50 State Flag stamps for the U.S. Postal Service in 1976 and was a consultant on several subsequent stamp projects. In November 2013, Reed donated his illustration archive to Washington University. A kind-hearted and generous individual, Reed encouraged others to forge careers as curators and historians, and as collectors of the illustration arts. His writings, which reflected his vast knowledge about the history of illustration and individual American illustrators, established a significant base of scholarship, and have spurred appreciation and understanding. 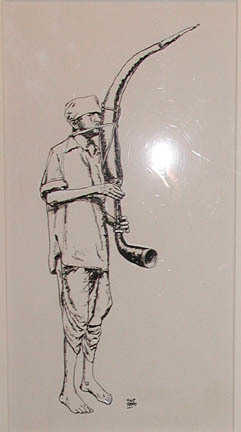 Reed, Walter Arnold, “Indian Street Musician,” Westport Public Schools Digital Collections, accessed April 25, 2019, https://collections.westportps.org/items/show/566.